Tas is a professional artist working from his Nottingham studio. He is relaxed yet passionate about his work. 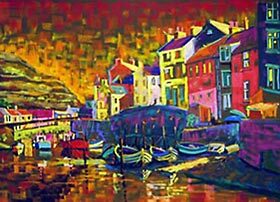 There is much breadth to his art, as he works in a number of mediums and his style varies from graphic realism to loose and abstract. His first love is with oil, but for some time now the emphasis of his work has been with pastel – most of his awards have been for pastel compositions. The subject of Tas’ work is as varied as his style and use of medium. Scenes of Venice, English coastal towns, seagulls, robins and landscapes are very popular with buyers and collectors. Visitors can view the full extent of Tas’ work in his studio. He can usually be found in his studio at Patching’s Art Centre on Wednesday, Thursday, Friday, Saturday and Sunday. Visitors will always receive a warm welcome. As an award winning artist Tas exhibits in London and across the country.